Do you want to extract sound/audio from favorite video? AoA Audio Extractor program makes this all easy process involving few simple clicks. It allows you to extract and save audio from videos files and save in desired audio format like mp3, wav, ac3. Besides basic functionality it has number of other features. 1. Supports video types: AVI, MPEG, FLV, DAT, WMV, MOV, MP4, 3GP. 2. Extract audio from videos & save in MP3, WAV or AC3 format. 3. It allows you to save any portion of the audio from a video file. 4. Support batch conversion for quick audio extraction from multiple files. 5. It is all free for download and use. 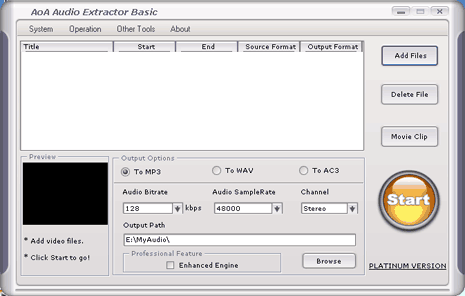 Download AoA Audio Extractor for quick and easy extraction of audio track from videos. (This program does not support DVD video format).